The geology beneath the landscape and above the bedrock is an area full of interpretation and extrapolation. Unconsolidated materials are, as a general rule, not as uniform as lithified materials. These deposits are generally made of alluvium, glacial till, wind blown silt and sand. Subaerial deposition of materials leads to an almost instant modification from weathering and erosion- soil forms, hill slopes develop, streams and rivers form, etc. Paleo-surfaces can often be buried by subsequent glacial advances or meters of windblown sediment. All of these sediments overlie bedrock and they can, in some places, be over 700 feet thick. The goal of this project is to create a more three dimiensional way to explore geologic material. Understanding the subsurface increases the accuracy in disciplines like hydrogeology and stratigraphy. Aquifers and aquacludes surfaces need to be precise to be useful. Interpolation techniques can be implemented to generate these surfaces if the data is sound enough. The extent of the aquifer is one of the most basic parameters to set and influences almost all outputs. The range of a stratigraphic unit is also important since describing the area of a lithology has implications for any other investigation. 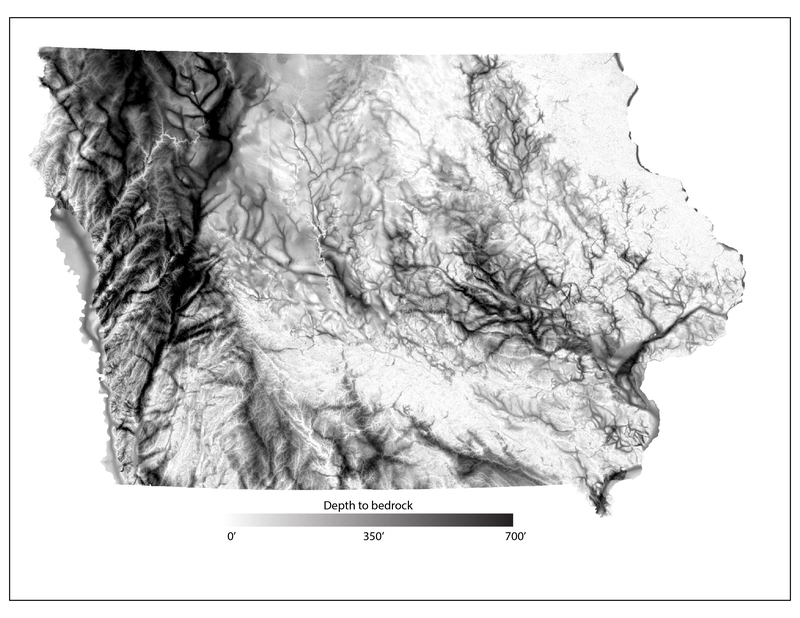 Data used for my area consists of samples collected from water wells in 5-foot intervals from the Iowa Geological Survey's GEOSAM database. The lithologies were described and logged on paper like coarse crystaline limestone, vuggy fossil moldic dolomite, fissile shale, sand, unweathered till, soil, etc. I converted them into simpler units that would fit the simple purposes of trying to find different hydrologic and basic weathering derived surfaces. The units were broken down into unweathered till, weathered till, sand, and bedrock. The evelvation and coordinates were attached to the data points. The overarching goal is trying to see the likelihood of sub surface contacts and to see if these contacts are laterally extensive. One of the main difficulties is trying to see boundaries that could occur in increments that are below the sampling threshold. The quality of sampling is also an issue- samples are generally assumed to be uniformly collected, but that is likely misplaced faith. The study area is centered around the Colwell 7.5' quadrangle. This area lies in north-central Iowa. The surficial geology of the area is dominated by thick packages of glacial till and sand bodies. Glacial till in the area acts as a non-permeable layer protecting groundwater, which is where most of the population draws its drinking water from. Within and beneath the till, in some areas, are sand bodies. These bodies represent either glacial outwash, englacial or subglacially derived sand sheets, or surficial alluvial deposits. The study area (shown in green) lies within Mitchell, Howard, Chickasaw, and Floyd counties. The data was projected in ArcScene. The base would be the bedrock surface made from the call between surficial materials and Devonian-aged carbonates. Currently, 3D technique does not lend itself to any analytical process beyond initial visualization, though there was indication that there is a sand body at the bottom of the bedrock channel. This sand body could potentially be a large source of ground water to citizens living above it. Future work should take a more quantitative approach using algorithms to show more certanty between both sand bodies and till/till contacts. More samples should be collected in the area as well. There is great potental to do geochemical work to tease out differeces between till units.